American Metalcraft BWF3 Carbonized Bamboo Three Compartment Paring Flight Board - 13 7/8" x 6 7/8" x 1 1/4"
American Metalcraft BWF4 Carbonized Bamboo Four Compartment Flight Board - 13 3/8" x 3 3/8" x 1 1/4"
For a trendy addition to traditional table top service, serve all of your enticing sauces and dips in this Carlisle 602500 stainless steel 2.5 oz. ramekin. 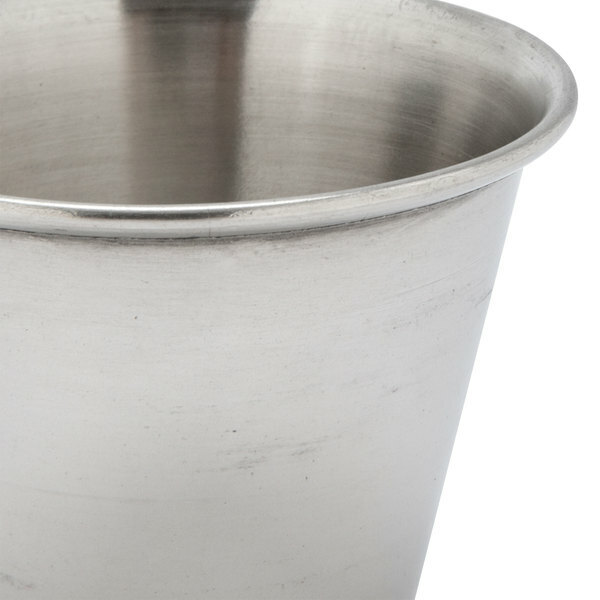 It's made of rust-free 18-8 stainless steel for years of durable service. 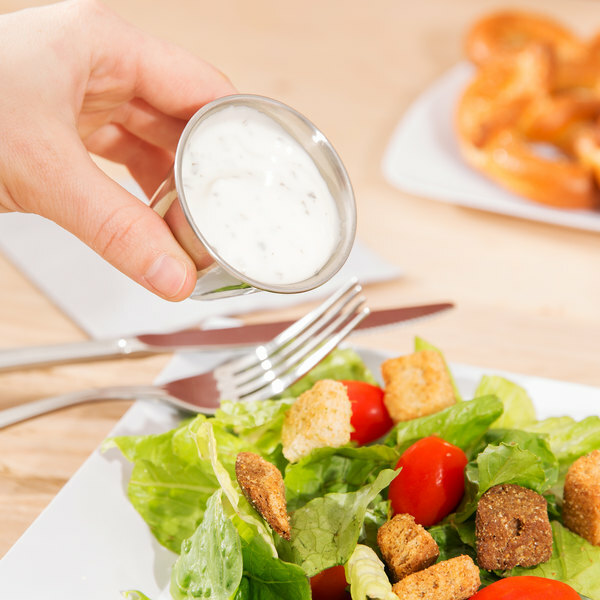 Use this ramekin aside of your appetizers, entrees, sides and desserts for holding butter, salsa, salad dressings, condiments, and other dipping sauces. Durable, scratch resistant containers for sauces and condiments. We use them for dressings, condiments and spices. They do stack tightly, so drying them first before stacking is recommended. These are a great deal for a case of 144 ramekins. These are way cheaper than the other places. An excellent product and well made! 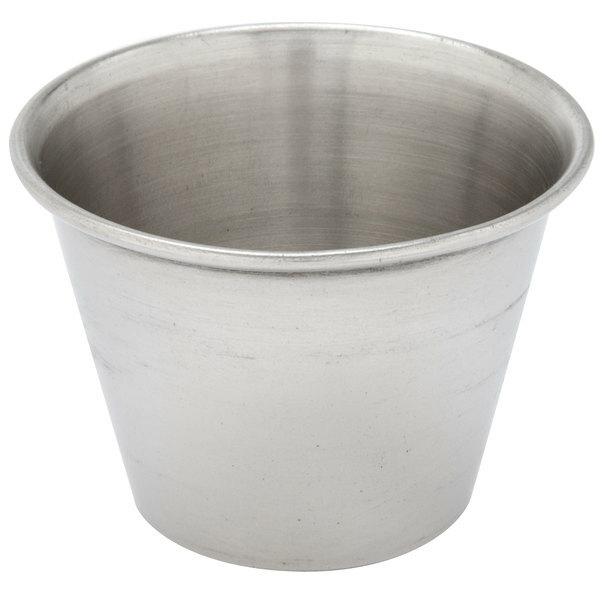 We use these to serve sauces, dips and butter. I am torn on this product. It is extremely well made and does exactly what it is supposed to do. There is no doubt about that. But if you are to buy these to send out to the dining room floor I would recommend a magnetic lid for your waste can. 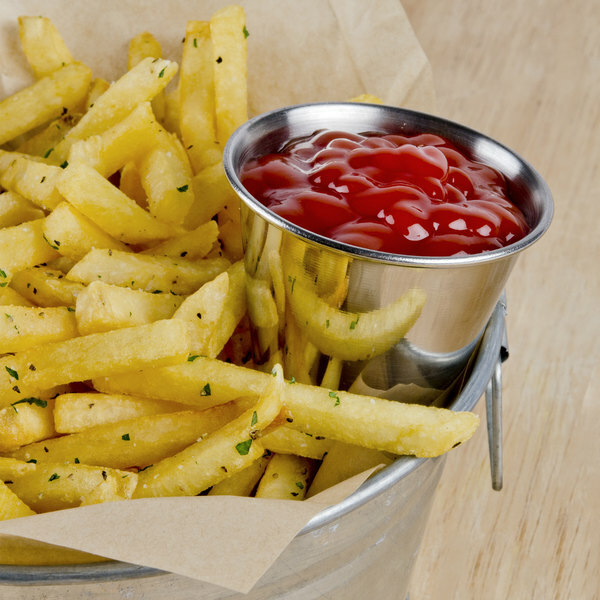 Even the most attentive server will toss these out on accident. It can tend to get expensive to replace them. We purchased a lid and they are a little up there is price but it has also saved us on MANY other purchases; spoons, forks, knives etc. Just keep that in mind. With that being said we use these still and its a really nice touch for plating and presentation. 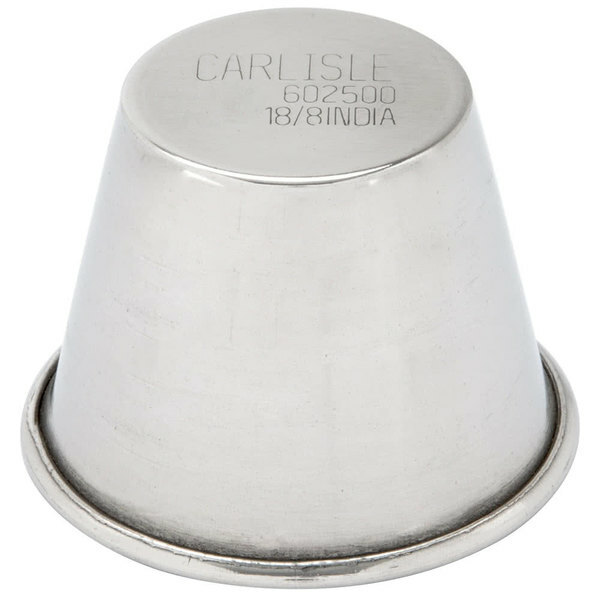 This Carlisle stainless steel ramekin is perfect to serve ranch or bleu cheese dressing with an order of wings. They're stainless steel, so they'll last until my servers lose them haha. I keep buying these again and again because we use them for all of our sauce sides and as you probably know, they "walk away" a lot. They look much nicer than the plastic ones and stack well. pretty standard little ramekin for sauces and things in most restaurants. they stack together well and are small enough to not take up tons of space. Great for portion controlling sauces. They can hold up to heavy use and have yet to rust or debt from washing. Keep your eyes peeled because they can very easily be thrown away! 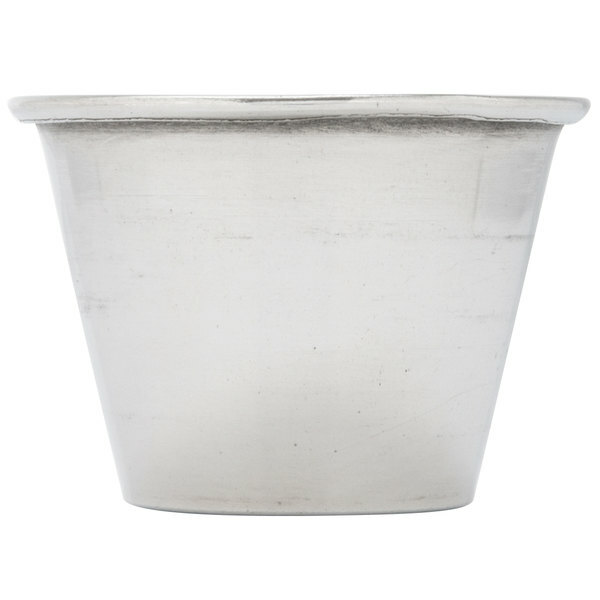 These ramekins are nice and thick- the gauge is perfect for heavy use and repeated washing- we've used these for years with no sign of rust or denting. Perfect size for sauce sides. Will purchase again and again! 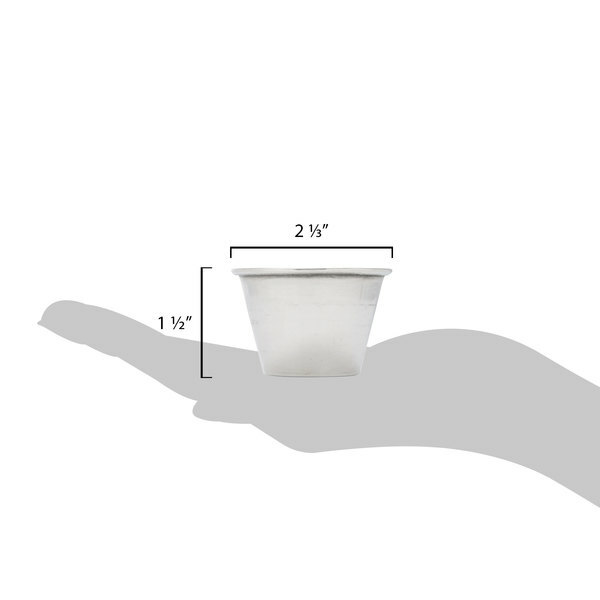 The ramekins are light weight and very versatile. They are inexpensive, the only issue is that since they are so small, they get thrown out a lot on accident. I am using these for our side sauces. Very classy, durable and easily cleaned. I would recommend these to any casual restaurant who offers table service. These ramekins are a workhorse in our restaurant. We use them for absolutely everything and they are great. Really durable and they hold up great to the prolonged heavy use. The sauces come right out of these making the sish washers life so much easier. Perfect sizr for side sauce so you dont lose topo much money. 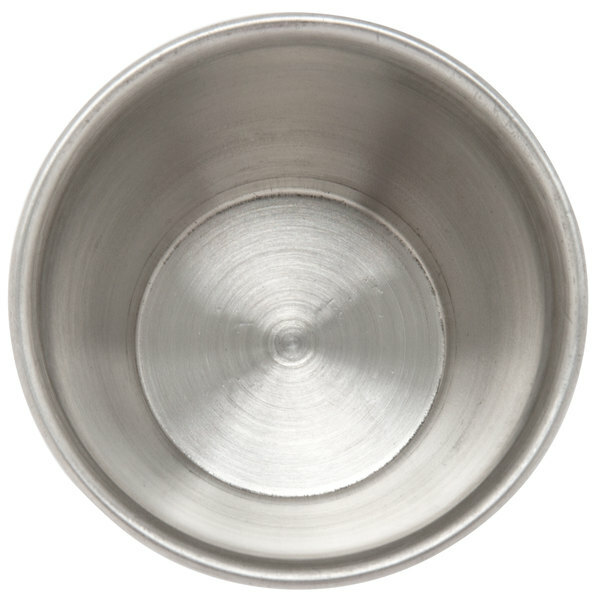 These stainless steel ramekins are the perfect size for sauces on the side as well as condiments! They work great for small portions/tastings as well! !